Global leaders, CEOs, and other influential figures gathered at the World Economic Forum’s annual meeting in Tianjin, China have been reacting to Friday’s news that Britain is to leave the European Union following a referendum. "You are talking about the diminishment of the most important alliance in the post-war order, the transatlantic relationship, which was already before Brexit at its weakest since World War Two. You're talking about not only the removal of the UK from the EU, but you're also talking, I think reasonably likely, about the eventual disintegration in further part of the UK itself. And you're also talking at the very least about the severe diminishment of what the EU actually means, its footprint globally, its common values and its ability to continue to integrate." 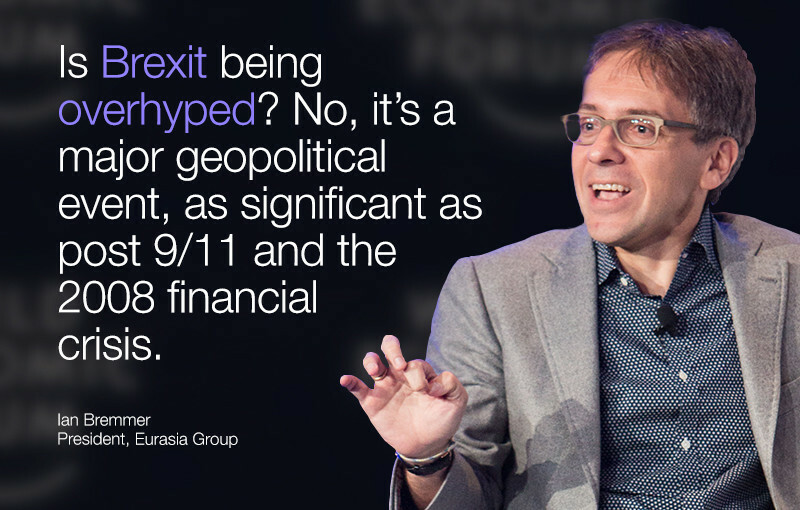 Follow the debate: Simon Smiles, Rachel Morarjee and Nouriel Roubini discuss the implications of Brexit at the 2016 Meeting of the New Champions in Tianjin, China. Watch the video here . What does Brexit mean for Britain's economy?